Both my offshore stocks announced 2Q results this week. There is nothing too surprising as both companies continue to achieve stellar growth year over year (yoy) at the back of a strong offshore industry outlook. 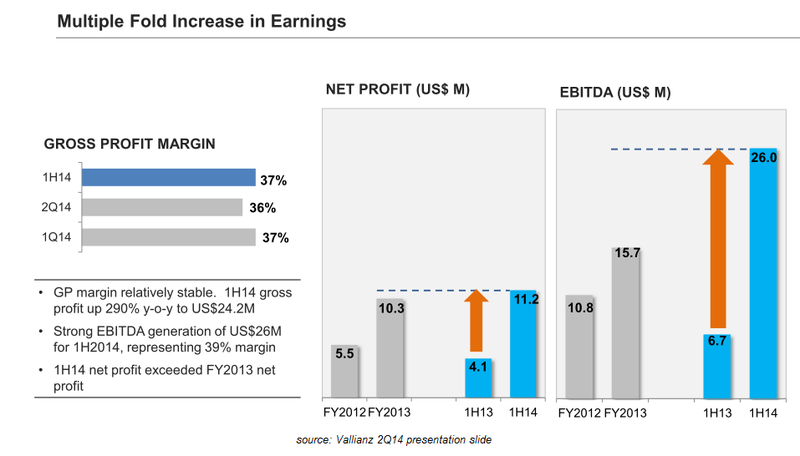 For 2Q14 comparing yoy, Vallianz doubled its net profit to US$5.8m and group revenue surged to US$38.6m vs US$4.7m. 1H14 net profit surge 172% to US$11.2m on the back of 787% growth in revenue to US$66.3m. Revenue expansion is propelled by long-term charters with major oil companies. GP margin healthy and stable. Overall, 1H14 net profit exceeded FY2013 net Profit. As of End 1H14, cash position increase to US$44.1m from US$1.8m half year ago. Shareholders’ equity increased to US$141.5m 1H14 vs US$42.7m End13. Total liabilities were US$598.8m 1H14, comprising largely of loans amounting to US$361.3m to finance the purchase of vessels. The Group also has notes payable of US$124.9m that were issued under a Multicurrency Debt Issuance Program. Pros: Higher revenue and profits in FY14. Around 50% of current order book of US$494m, expected to be recognised over 2014 and 2015. Prospects in Middle East and Mexico bright, and target entrance to west Africa. Tendered 1.2b of projects, with its wide range of vessel types at a healthy average fleet age of 2.3 years. Cons: High growth from high debt means high risk. Employees may find difficultly to cope and output may lag exuberance growth. For 2Q14, Nam Cheong ‘s net profit surges 53% to RM63.0m and revenue rises 38% to RM378.8 million qoq. Gross profit margins still at healthy levels of 18% in 2Q14 although it fall 2% yoy. For the 1H14 comparing yoy, Net profit surged 75% to RM134.4m vs RM76.9m and Revenue rose 54% to RM786.1m vs RM510.1m. Healthy cash position of RM194.2m with low net gearing ratio of 0.60 times as at End 1H14, providing headroom for growth. NAV per share as of end 1H14 is 47.6 sen vs 44.6 sen as seen End13. Pros: Expect another record year with 20 out of 30 vessels due for 2014 already sold. Large order book of approx RM1.7 billion. Bright outlook driven by Petronas increase Capex commitment. Cons: Risk of Build to Stock business model unable to sell in situation of an economic crunch. Vallianz - Dragged by Swiber and Shares Placement?